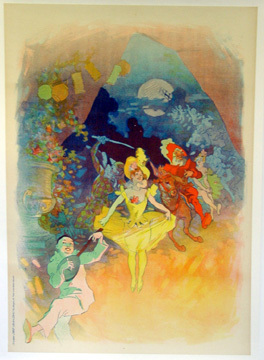 This is the before the lettering version of Chéret's charming poster for Les Fantoches, a puppet show extravaganza staged at the theater of the Musée Grévin, a frequent client of Chéret's. In fact, the design appeal to them so much that they used the same image for another show called Fête des Artistes. Some versions of the image, such as this, show the printer's name, while others have no text at all.